Had a wonderful couple from San Jose California check in and they brought an unexpected guest with them. 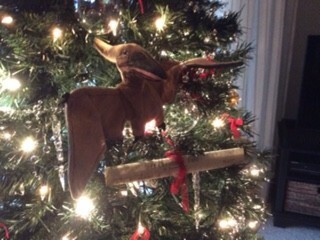 Meet Pterry the Pterodactyl who landed in the Christmas Tree shortly after their arrival. Apparently Pterry has traveled all over the world with them and he made a great guest, he was very low maintenance, didn’t need breakfast and never made a sound during his visit. Pterry ended up making a very interesting addition to our Christmas Decor!